You are here: Home / Buying & Selling Strategies / Challenges for Baby Boomers: What’s In Store For the “Me” Generation? 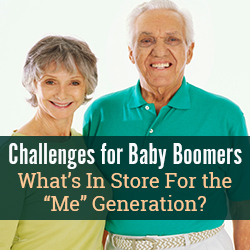 Challenges for Baby Boomers: What’s In Store For the “Me” Generation? Baby Boomers fall into two categories: Planners and Procrastinators. They either Plan for retirement (choosing where and how to live) or they Procrastinate and let others make the decision for them. Many prefer to Age-in-Place in their current home. Depending on the style of residence they live in, this option may or may not be possible, since the cost to remodel may not be feasible. A consultation with a Certified Aging-in-Place Specialist can help them make the decision (the National Association of Homebuilders Remodeler’s Council offers this designation nationally and maintains a database for users to find contractors in their area). There will be a steep increase in the “Suddenly Single” population. Many Baby Boomers will face a divorce or the death of a spouse, which will change their lifestyles dramatically. Planners will adapt to these changes more easily than Procrastinators. There will be an increase in housing options, in addition to what’s already available. The “Village” concept allows Baby Boomers and Beyond to Age-in-Place while those in their surrounding neighborhood provide social support and services for them, for a fee. Granny flats (a small residence is built on the property for the grandparent) are another concept that is slowly being implemented through zoning changes. Co-housing will gain in popularity, especially among the growing numbers of singles (many are women) who pool their resources to live with others in a communal environment. Multi-generational housing is a concept that is being explored by builders. It allows Baby Boomers, and their parents and children, to co-exist under one roof. This solution can help families live comfortably, since many of the Baby Boomers’ children are saddled with student loan debt, and Baby Boomers are caring for their parents. Baby Boomers do not want all want to be segregated into age-specific retirement communities; they prefer inter-generational interaction. Look for competition to ensue when downsizers compete against first-time buyers for condos! And purchasing a second home, which will become the primary one when they retire, is on the upswing again. Renting will be a popular option for those who don’t have the down payment money or inclination to own. Regardless of the type of housing decision they make, Baby Boomers will still need to de-clutter their homes. Many have been in their homes for 20 years or more and they have accumulated years of memories. Aging in Place requires de-cluttering to allow freedom of movement in the home; moving requires sifting through attics, garages, and basements to reduce the amount of possessions they take with them and prepare the home for prospective buyers. Look for an increase in home inspections. As Baby Boomers age in place, many who have been in their homes for years have deferred maintenance issues that arise. A professional home inspection will find many problems which can be solved by professional contractors. Water seepage (mold), drainage issues, pests, and other issues are often discovered when a house is de-cluttered. Solving these problems will help Baby Boomers stay in their homes safely. Fitness will increase in popularity. Baby Boomers will want to stay in shape so they can keep their medical expenses down in retirement. Fitness centers that cater to the Baby Boomers’ needs will continue to sprout up around the country. Many Baby Boomers will retire from their current job and launch new careers that provide stimulation and satisfaction. Many others will continue to work part time, whether by necessity, or the desire to balance their days with work and play. Volunteering and “giving back” will prove more popular. Baby Boomers grew up when the Peace Corps was started in 1961; they now have time (and money) to travel and do good for others. Baby Boomers want recreational activities that include exercise like swimming, boating, walking, and biking. Golf is not the favorite pastime for this group as it was for their parents. Baby Boomers don’t want to be reminded they are getting older. This fact will encourage companies to develop new ways of providing “invisible aid” to this independent-minded generation, whether it is easier removal of jar lids or redesigning a kitchen or bath to accommodate the changes they face. Companies that provide services that cater to their needs will increase as well. As Baby Boomers age, whether in place or through a move, there will be a shortage of qualified help to assist them. Housing options will need to include services to accommodate those needs. Many tasks, from simply turning a mattress to taking out the trash to transportation services will be challenges to overcome. This generation redefined traditional values and is not afraid of change. The next several years will show how they will re-invent retirement! Historic Homes: Is ‘Owning Old’ Right for You? Debbie Miller is an Associate Broker with McEnearney Associates, a real estate company based in Northern Virginia. 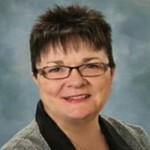 She is a Lifestyle Transition Specialist® who has worked with clients 55 and better for the past 20 years. She helps them, through seminars and individual consultation, to make housing decisions that are right for them.